The required toolchain can be installed by following this tutorial. 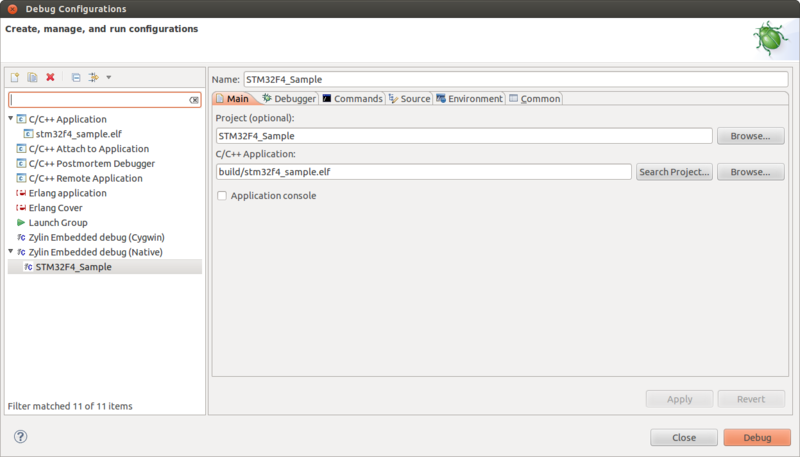 Also, install eclipse as is described there and import the sample makefile project. follow the steps to install it and restart eclipse. You have to change the path to the hex file in the write_image command above. That’s it for the Eclipse part! You can’t start debugging yet though, you have to start the openocd server first. As you can see, it should be fairly easy to modify this file for other MCUs. You can go to ~/sat/share/openocd/scripts/target to find other target files for openocd. 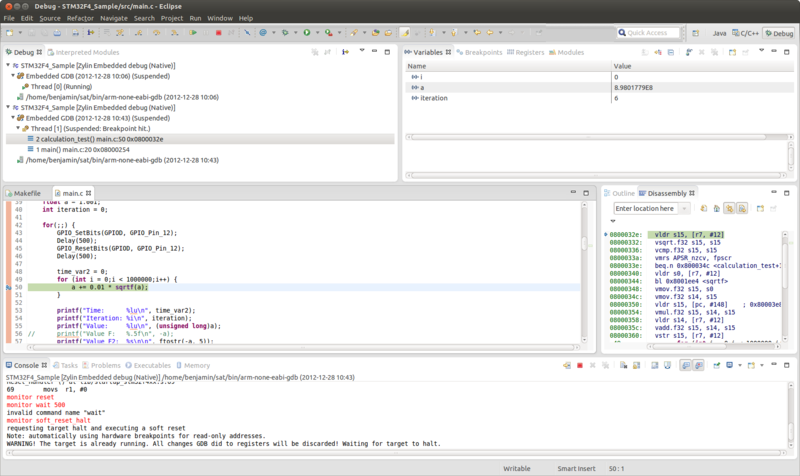 Now that openocd is running, you can launch the debug configuration in Eclipse and open the Debug perspective. Then you should see something like the screenshot in the beginning. Note that when you start debugging, the program will be uploaded to flash of the STM32 as well. When the debug session is started, you can click on Resume (F8) to start execution. Then the program will run until you click Suspend or until you hit a breakpoint, then you will see the current line you are executing in the source code and the variables and their values in the current scope. Breakpoints can be set/toggled/reset by right-clicking in the leftmost part of the source code editor. If this is done while the program is running, it will halt as soon as the breakpoint is hit. Sometimes it is not possible to start the debug session or it “kind of” starts, but does not seem to work correctly. This can often be solved by stopping openocd, unplugging and re-plugging the board and then starting openocd again. Some variables cannot be seen or changed and the assembler code does not seem to match the c-code perfectly. Only the disassembly is shown when pausing the program or when hitting breakpoints, but not the c source file. This information is then used to display the line numbers and variables in the source file. This entry was posted in Embedded Software, Tutorials and tagged ARM, gdb, linux, STM32F4, STM32F4 Discovery, toolchain, tutorial, Ubuntu by Benjamin. Bookmark the permalink. Hi there, great tutorials you’ve got here, thanks :). I got a STM32F4Discovery and went through your Get started article yesterday and was able to compile using Eclipse. I used the zip file from provided in the Get started article. I got your version from github now, but the script is stopping at :”Patching binutils to allow SVC support on cortex-m3″. The last output is Patch: *** Onlygarbage was found in the patch input. did you download the patch directory as well? Only the script itself does not work as it assumes that the patches are present a certain relative location. I ran it right now on my desktop, and it works fins for me. I found out that you can also use Texane stlink (https://github.com/texane/stlink) to open the connection. It works default on port 4242, but openocd works better however. Also, you can debug microcontrollers from other manufacturers than ST. If you can download a program using stlink-V2 and openocd, you can debug the microcontroller. I have succesfully debugged my LPC1313 (using a custom cfg-script since it’s not natively supported by openocd). Well, the console message looks very similar to what I get (and I realized the wait command isn’t working, so I removed it). Do you get the error as soon as you start debugging or are you doing something first? After I start the debug session (and get the same console output as you) I can click Resume in eclipse to start the program (the LEDs in the discovery board indicate that it is running). When I click in pause I see the source line the cpu is executing and the variables in that scope. Resuming, pausing, setting break points etc should work from this point without problems. However, sometimes the debug session does not start properly, so then I have to unplug and replug the discovery board and restart the openocd server. Hey, yes I,m getting the Error: “Target request failed: Warning:\Cannot insert breakpoint 1. Error accessing memory address 0x800ad98: Unkown error -1.” as soon as i press the Debug button. maybe somehow gdb is not able to halt the running boards application? that seemed to do the trick for most of the time! Your tutorials are just amazing: clear and complete. Thank you for this valuable resource. But I have one small problem. If I modify the program and start a new debug sesion, the program acts like the previous one. OpenOpcd seems to write the new program succesfuly. (I tried with bouth variants of the scripts and using -g, -O0 when compiling). 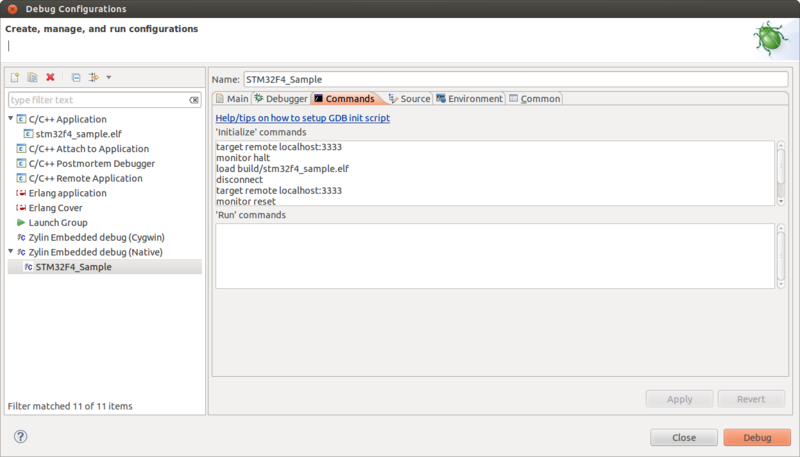 I have made another test, if I writh the .bin file using qtstlink, debuger works again perfectly. It is like elf file is not written corectly. 1. 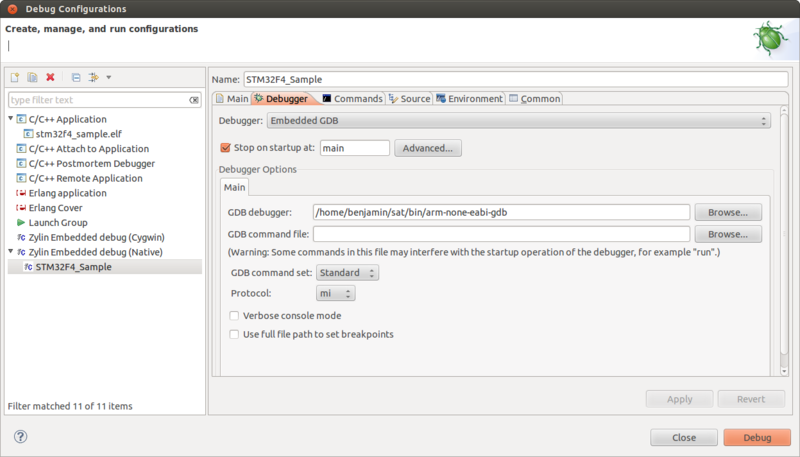 Install the GDB Hardware Debugging plugin. Search for it in the “Help -> Install New Software” window. That is it! The rest can be default. Just click “Debug” and enjoy. Thanks for the tutorial, I have an issue that I’m unable to do any useful debugging due to no symbols being loaded. Which version of openocd are you using? In my summon-arm script I had to patch openocd for debugging to work at all on the stm32f4 and stlink. For me, it only works about every second time I start the debugger, and I guess this is because the stlink-support is a bit limited in openocd. I have updated the summon-arm script on my github page with gcc 4.8 and the very latest versions of the other tools as well, so you could give that a try too. I haven’t tested it yet with debugging though. Thank you for very clear and helpful tutoriuls. I have a weired problem. When I start debug I get a kernel panic. I can share more info it I know what is relevant. I have the same bourd as above with usb on ubuntu 13.04 and I have debugged with the same tutorial another arm bourd but cortex-m3. I don’t know if it is a good idea to use USB on the MCU and pause the execution – this will block USB interrupts and could go against the USB specification. I think that a kernel panic is a bit heavy reaction though, I haven’t experienced that myself. Transfer rate: 7 KB/sec, 4124 bytes/write. why it went out”0x08000fa8 in ?? ()”? I’ll be grateful if you can help me! Do you have any idea why this fails? I haven’t seen your code, but one similar issue I had is that the SWD interface stops when the MCU is put into sleep mode. It will also stop working if you put the SWD pins into some other mode e.g. GPIO. So, make sure that sleep (WFI) instruction isn’t used and that you don’t reconfigure the SWD pins. I have found the reason for my problems: Virtual folders. If I remove all virtual folders from my project, the debugging works. please help me out i am getting error after make upload of bootloader, that adapter speed doesnt match. .. and in GUI window its showing no firmware, but i follwed your instruction same as your vedio..
I’m trying to use this debugging tutorial with the VESC. I’m currently using a ST-LINK/V2 programmer by ST. Everything went fine, but I got one problem : I cannot see the printf output in the Eclipse terminal. I bought my VESC on Enertion website so I don’t know if all the necessary hardware is already on that board in order to do some debugging. Very helpful article. I was in a problem with stlinkv2. Your qstlink works very well. Thank you.